On a business trip to northern Montana this week, I had the chance to fish the Missouri River near Great Falls. Word had it that the pink scud was the trick. I have never really gotten into pink scuds, typically I'll fish olive, tan, grey, brown...just not pink. I don't know if this is a man thing... So, I'm fishing, and I catch a nice rainbow on an RS2. 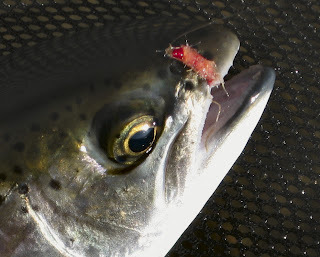 I spotted some large trout hanging out in a turn, so I decided to slap on the pink scud, since they come so highly recommended. I had tied some based on a recommendation from a guy I met on the South Platte in CO, that he ties them with a red body, and it 'bleeds' through in the water, looking like blood to the fish (his supposition). I also dropped a small midge off the scud. I sneek up, and pull a textbook case...target the fish, cast upstream far enough so as not to spook the fish, watch the drift...and he took it! 18" of strong rainbow, a lot of fun to catch. I managed to catch several more throughout the day, including another 18", all on the pink scud. I'm a believer!